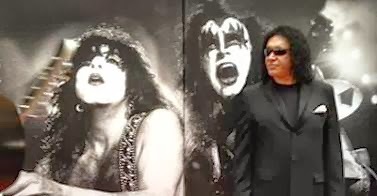 KISS frontmen Gene Simmons and Paul Stanley appeared at Los Angeles International Airport for a limited engagement Thursday: the opening of a Rock & Brews Concert Bar & Grill in Terminal 5. "We're like the 'Sunshine Boys' of rock," Simmons said at one point amid the sliders and shots being served. And yes, they will rock you -- while you grab a bite and a brew on your way to your flight. The two schmoozed and speechified (no makeup, no music, all business) at the first airport location for the restaurant brand they co-created. It's all part of the $30-million makeover of the terminal helmed by Delta Air Lines. Here's a look at the bar's opening day.